The majority of the gold that is being shipped to the east springs from the UK, from the vaults of GLD (that lost 429 tons) and the LBMA. 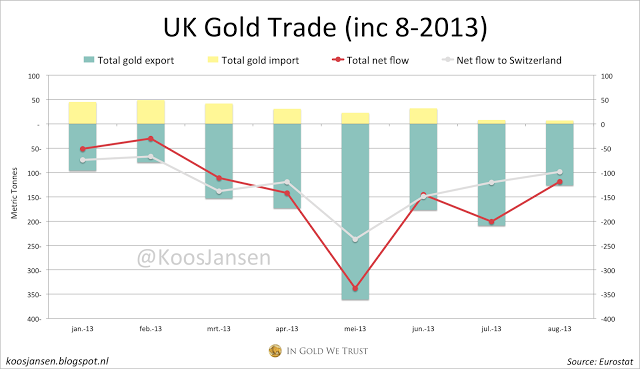 Year to date the UK has net exported 1137 tons of gold in total, of which 1002 tons to Switzerland and 101 tons to Hong Kong. According to the biggest refinery in Switzerland all the 400 ounce Good Delivery bars coming from the UK are being refined into smaller bars and then sent to China. 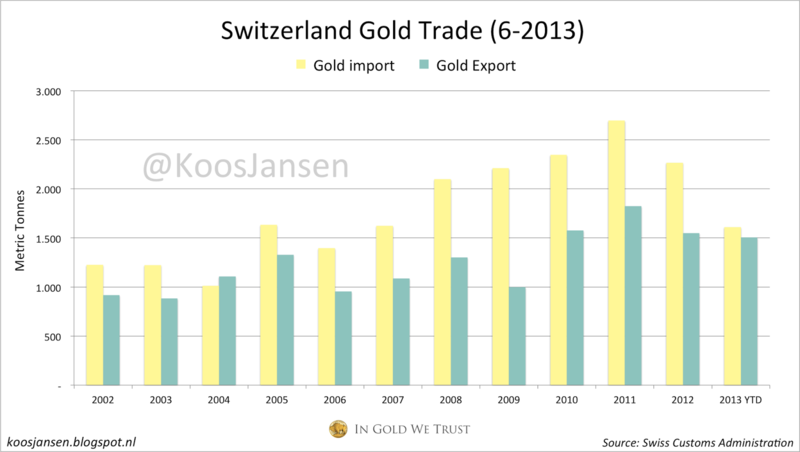 The Swiss customs department doesn’t publish their gold trade data per country, but if we look at their total trade (from H1) we can see that this years gold import, is directly exported. The Hong Kong Census and Statistics Department does give us detailed information about their gold trade. Net import from the Swiss has exploded this year, standing at 598 tons year to date. Other major suppliers to Hong Kong are Australia (106 tons), the US (117 tons) and South Africa (114 tons). Although a quite significant portion of this gold stays in Hong Kong, the bulk of it is brought across the border to the mainland. 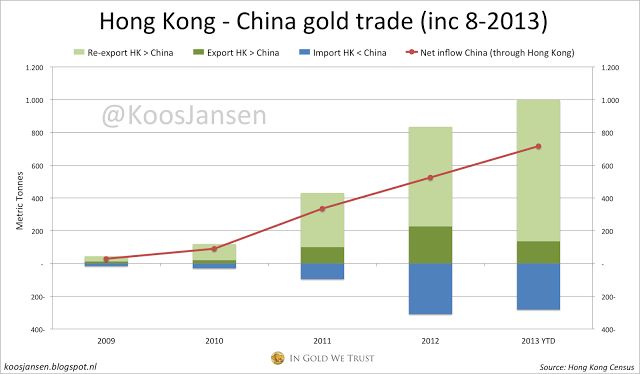 Up until August China mainland has net imported 717 tons of gold from Hong Kong. Is that all? No. Recently I’ve found out that physical delivery at the Shanghai Gold Exchange equals total Chinese gold demand (click here to read my research). And because demand must equal supply, supply must equal SGE delivery. Gold supply consists of three categories; mine, scrap and import. Total SGE delivery in the first 8 months of 2013 was 1499 tons, so domestic mine production plus scrap plus import should equal 1499 tons. Chinese mine production is estimated to be 400 tons by year end, this would be 266 tons in 8 months. In 2011 Chinese scrap supply was 400 tons. It will be far lower this year because of a lower gold price. Lets say scrap will be 300 tons by year end, this would be 200 tons in 8 months. A quick sum tells us how much total Chinese gold import in the first 8 months of 2013 must have been. Total import must have been 1033 tons, import from Hong Kong was 717 tons which leaves a gap of 316 tons. 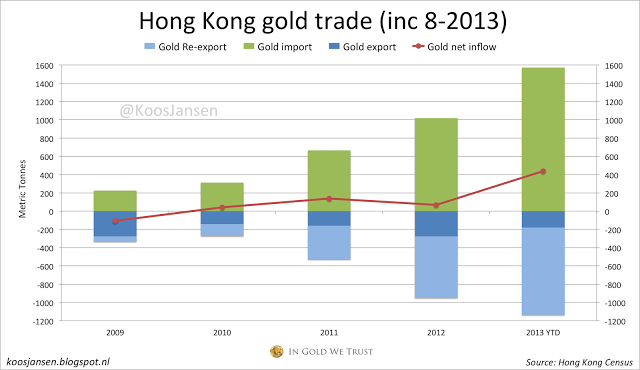 Concluding that China has net imported, from January till August, 316 tons of gold through other ports than Hong Kong. 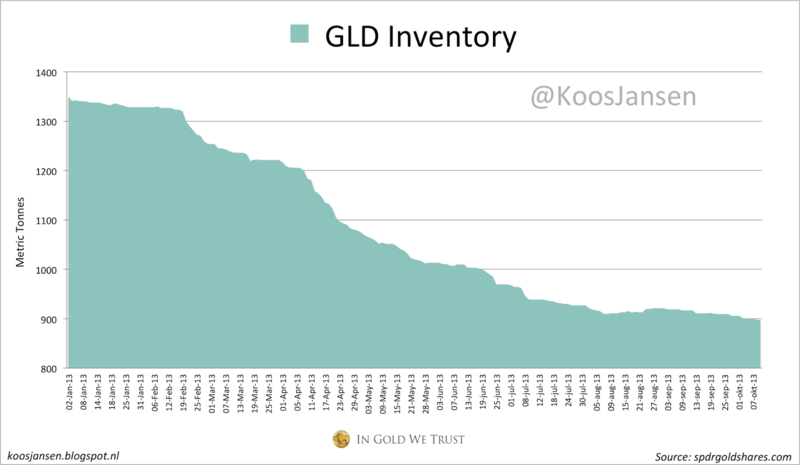 This could have come from COMEX inventory or from Chinese overseas mines, who knows..
China Continues To Drain Global Gold Inventory SGE Withdrawals 29 MT In Week 16, YTD 635 MT Shanghai Gold Exchange Physical Delivery 1750 tons YTD Debunking GFMS’ Gold Demand Statistics China Gold Import Jan-Sep 797t. Who’s Supplying? 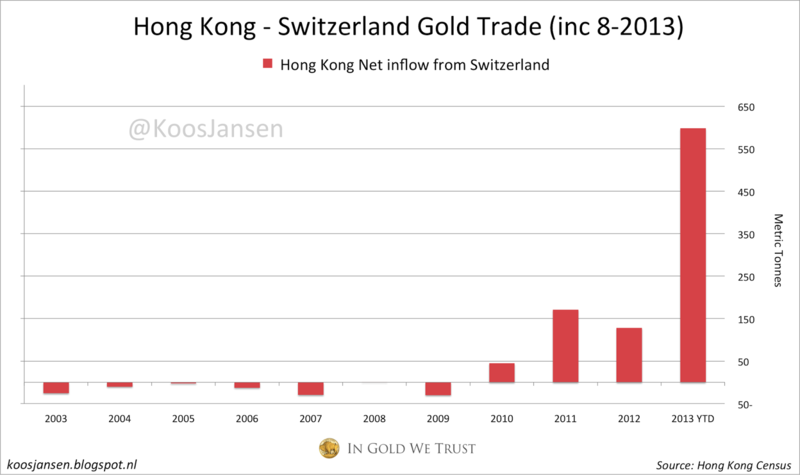 Why Austria Is Repatriating Gold From London SGE Withdrawals Equal Chinese Gold Demand, Part 3 How The World Is Being Fooled About Chinese Gold Demand Dutch Central Bank Tight-lipped About Gold Policy China’s Secret Gold Supplier Is Singapore Second Thoughts On US Official Gold Reserves Audits Audits Of US Monetary Gold Severely Lack Credibility Unprecedented Total Chinese Gold Demand 2013 Hong Kong – China gold trade yearly How Much Gold Is China Importing And Does It Still Correlates to SGE Withdrawals?